We carry everything from traditional black steel, low profile brackets for small ornamental light poles to the high end Airo bracket for large banner mounting and high wind areas. For stylish and sleek designs, we offer decorative pole banner hardware to finish off that ornamental look to the bracket. We have many banner brackets and mounts in-stock and can usually ship within 24 hours of your order. 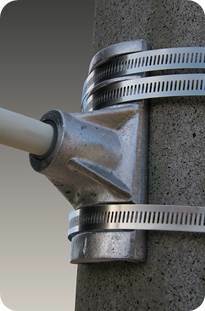 Additionally we have the capability to customize steel and aluminum brackets to fit any size light pole or wall. Call us at 800.395.2468 or fill out our Contact Form if you have any questions about light pole banners and brackets.